About 14 years ago, Carolyn Pifer of rural Manistee, Michigan, told her primary care doctor that something was wrong. The doctor said he’d give her a phone number for a psychiatrist, but he never did. “I left the office, having humbled myself to say that there was something wrong, only not to be addressed or taken seriously,” she said. Within six months, Pifer was experiencing suicidal thoughts and found herself in the psychiatric system. I had to find a way to put my life back together again and find out what the new normal was going to look like. 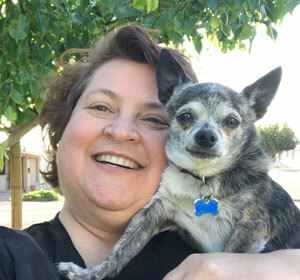 Like Pifer, seeking help for her mental illness led Hunter on a new path of understanding mental health as well as a new career path: “my career in marketing I just left behind. And all the money that comes with that!” Through the Peer & Family Career Academy (PFCA), she now provides peer support training in rural Arizona counties. Peer support specialists (PSSs) are similar to community health workers (CHWs): individuals who receive professional training to provide a specialized service. But, in contrast to CHWs, peer support specialists must be in recovery for a behavioral health condition. Effective as mentors because of their lived experience, PSSs can assist clients with everything from completing paperwork and providing transportation to finding community resources. I think the peer support movement is a wonderful opportunity to bridge some unmet service gaps in a unique way that addresses not only workforce capacity but also addresses some of the unique needs of the population by having someone who brings in that lived experience. “I think the peer support movement is a wonderful opportunity to bridge some unmet service gaps in a unique way that addresses not only workforce capacity but also addresses some of the unique needs of the population by having someone who brings in that lived experience,” said Rebecca Quinn, Center for Rural Health program director in North Dakota. North Dakota is working on formalizing its peer support process. Last year, there were seven trainings across the state with 189 individuals in attendance. 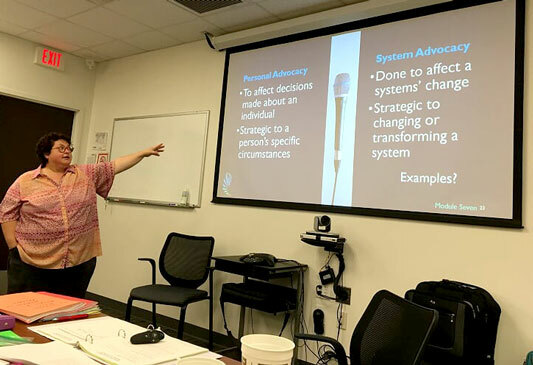 In Arizona, PFCA develops and provides two-day, topic-specific trainings, like an opioid use disorder class as well as forensic peer support for those who have encountered the criminal justice system. “The idea is when [our participants] show up Monday for work, they have a new set of skills,” said Hunter. PFCA used to offer trainings exclusively in Phoenix, which was a significant barrier for rural programs: Even though the training is free, programs sending PSSs still need to cover costs like travel and lodging. In addition, some rural programs may not have enough PSSs to cover the workload when others are away. Gloriana Hunter teaching in Yuma, Arizona. Instead, PFCA sends an employee to rural areas. In January, Hunter traveled to rural Yuma County and provided trainings as well as train-the-trainer curriculum so that programs can educate their own staff in the future. PFCA also researches these rural areas and adapts the trainings accordingly to best meet their strengths and needs. That way, the academy can avoid bias for “what our rural areas refer to as the ‘state of Maricopa,’” Hunter said, referring to Phoenix’s county. According to Jean Dukarski of Appalachian Consulting Group, which provides PSS trainings across the country, PSSs help reduce the workload for clinicians and other licensed professionals. Since they know what community resources are available, they can more quickly connect their clients, whereas a clinician might need to first research what’s available and then connect their patients. Quinn from North Dakota said that PSSs also help reduce the stigma of mental illness and substance use disorders, because PSSs “use their past lived experience to be working successfully and using it in a positive-growth way to help others.” Their work counters the negative stereotypes that clients and the rest of the community may have about behavioral health. In North Dakota, even though PSS trainings took place in the state’s largest communities, 81% of attendees were from rural areas. Quinn said that rural residents with a mental health diagnosis or substance use disorder are acutely aware of the difficulties in accessing healthcare as well as community resources like housing assistance. A peer support specialist training in Fargo, North Dakota. These trainees also know that there are few employment opportunities in their communities and are excited that “there may be employability in their lived experience.” In addition, Quinn sees an “If not me, who?” attitude among the rural trainees. “I think rural communities really understand the concept of helping out your neighbors,” Dukarski said. While they have unique strengths, these PSS programs face the same challenges as other rural health efforts. In Arizona, for example, Hunter said that rural programs are struggling to get clients into medication-assisted treatment (MAT) clinics because it takes a couple days for the client’s referral to be processed, which delays when a client can get treatment. One barrier for the clients themselves is transportation. Hunter has heard of rural clients who have to walk 40 miles from rural Camp Verde to meet their probation officer in urban Prescott because they have no other transportation option. She said that area organizations are looking for funding to have PSSs drive clients to probation hearings. Pifer in Michigan has been able to turn the barrier of transportation into an opportunity to connect. When she drives clients to their appointments, the ride can last anywhere from 30 minutes to four hours. While this part of her job puts a lot of miles on the agency vehicle, she said that the drive actually helps clients open up to her: Since they’re looking out a windshield instead of looking directly at her, they talk more freely. 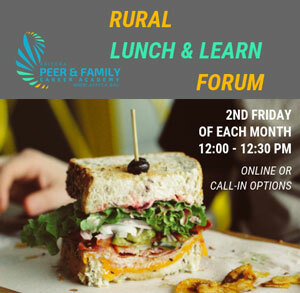 Despite these barriers, Hunter in Arizona loves that these rural programs are “willing to come to the table and see if they can bring these services together in a quicker way.” For example, Hunter hosts a monthly Rural Lunch & Learn Forum, in which peer and family support programs can call or use the online program Zoom. These conversations are recorded and posted online. 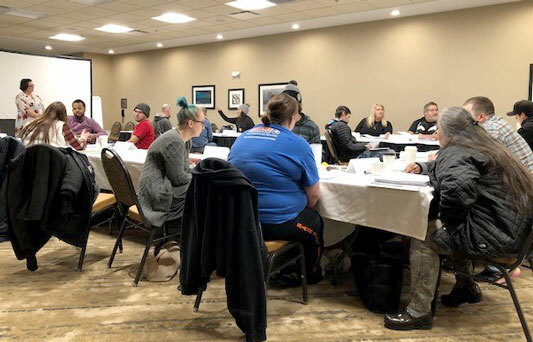 During the January forum, participants discussed systemic issues like the long referral process and an overwhelming amount of paperwork for clients dependent on opioids. Despite the challenges, PSSs see the progress that they and their clients are making. In Michigan, Pifer has seen clients graduate the program. One client, who will graduate this year, went from 22 hospitalizations in one year to four years without a hospitalization for a behavioral health issue. Another graduate was recently hired at Centra and no longer needs disability benefits. So many folks with a behavioral health diagnosis are people living in isolation, so having that connection, that someone I can talk to who just understands, is a huge benefit. This entry was posted in Features and tagged Arizona, Behavioral health, Behavioral health workforce, Healthcare workforce, Michigan, North Dakota on February 6, 2019 by Allee Mead.